AIMS AND OBJECTIVES: To assess the prevalence of third molar impaction among a sample of adult orthodontic patients in relation to their antero-posterior and vertical craniofacial skeletal patterns. The third molars (M3s), also called the "wisdom teeth" are the most variable of the teeth in man in terms of development and eruption.1,2 M3s may fail to appear because they are congenitally absent (agenesis) or fail to erupt because there is an obstruction in their path (impaction). Many factors have been implicated in these conditions. A meta-analysis has reported that M3 impaction occurs in 24.4% of the world population with no gender difference..3 A more locally based study observed an M3 impaction prevalence of 10.7% among urban Nigerians as against 1.1% in the rural area.4 The disparity in prevalence may conceivably be attributed to the low utilization of dental health services among rural dwellers in Nigeria.5 Impacted third molars have been implicated in the aetiology of oral infections, in neoplastic conditions as well as in the late onset of dental crowding6,7,8 and as a result, prophylactic extraction of M3s is often requested by many dental practitioners, including orthodontists. Reduced retro-molar space distal to the second molars has been reported as the single most important factor in the aetiology of M3 impaction, the availability of this space being dependent on growth of the jaw.9,10and the facial type categorized by the facial axis angle. This study assessed the prevalence of third molar impactions among adult orthodontic patients in a Nigerian tertiary care dental clinic and the relationship of the types of impaction with the antero-posterior and vertical cranio-facial skeletal patterns of the participants. Ethical approval was obtained from the Institutional Reviews Committee (Approval number: UI/EC/16/0177). Orthopantomograms (OPGs) and cephalograms of patients seen in the orthodontic clinic were examined. The records of patients who at the time of first clinical evaluation were 17years and above, had not previously undergone orthodontic treatment nor had had third molars extracted, were selected for the study. Demographic variables of age and gender of all subjects were documented. The presence of M3 impaction, affected jaw and side as seen on the OPGs, were recorded. The type of M3 impaction was documented according to Winter's,16 as well as Pell and Gregory's17 classifications. The Winter classification is based on the size of the angulation between the long axis of the impacted mandibular M3 and the long axis of the second molar. The Pell and Gregory classification assesses mandibular M3 impaction on the basis of depth relative to the occlusal plane of the second molar tooth (with categories A,B or C) and the mesio-distal width of the tooth relative to the ramus (with categories 1,2or 3). These two schemes are the most widely accepted classification systems for quantifying M3 impaction and form the basis for most other classification schemes, hence their selection for use in this study. A classification of maxillary M3 im-paction was described by Archer18 and corresponds to Winter's system for the mandibular M3 The radiographs were viewed on an X-ray film viewing box independently by both researchers and the result verified with the documented models of the classification. A 90% agreement between the researchers was achieved (p<0.05). Statistical analysis was carried out using the IBM SPSS package, version 22 (Armonk, New York, USA). Measures of central tendency were calculated and the relationships between third molar impaction and the various skeletal parameters were assessed using the Pearson's Chi-square. Findings are presented in Tables. Level of significance was set at p<0.05. Sixty-two patient records were assessed. The median age was 23.5years (IQR: 20 - 28). Twenty-eight (45.2%) subjects were males, 34 (54.8%) were females. There was no significant difference between the mean ages of the two gender groups (p=0.24: f-test= 1.40) and hence the data was analyzed jointly. M3 impac-tion was present in 32 (51.6%) subjects. There was no significant variation in the prevalence of third molar impaction between the gender groups (p=0.78). Fifteen patients (24.2%) had skeletal Class I, 31(50.0%) had skeletal Class II and 16 (25.8%) had skeletal Class III. There was no significant difference in the prevalence of M3 impaction based on antero-posterior skeletal type (p=0.98). There was also no significant difference in the prevalence of M3 impaction based on vertical skeletal classification whether the SNMP (p=0.14) or FMA (p=0.45) was the reference angle for assessment. Of the 248 third molars expected to be present in this study, six (2.4%) were congenitally missing in 3(4.8%) patients leaving a total of 242 third molars which were further analyzed in this study. The developmental absence of a third molar was recorded in six cases, all females, and affecting the maxillary arch in four instances (66.7%). Of the 242 third molars, 81(33.5%) were impacted. Fifty-two (64.2%) of these were found in the mandible, while 29(35.8%) were in the maxilla. Based on Winter's classification, vertical impaction was the most prevalent, seen presented by 26 (32.1%) third molars. Mesio-angular impaction was observed in 25(30.9%) third molars, disto-angular impaction in 22(27.2%) third molars, while horizontal impaction was the least prevalent and was seen in eight (9.9%) of the third molars. Disto-angular impaction was commonest in the maxilla while mesio-angular and horizontal impactions were limited to the mandible (p<0.001), shown in Table 1. There was significant relationship between Winter's classification of M3 impaction and the antero-posterior skeletal Classes (p=0.007). There was however no significant relationship between Winter's classification of M3 impaction and the vertical skeletal classification as presented in Table 2. On the basis of the Pell and Gregory classification, position 'A' and Class '2', lower molar impaction was most prevalent overall. Pell & Gregory category 3 impactions with the mandibular M3s most embedded in the mandibular ramus were seen almost entirely among patients with Class II malocclusion. Pell & Gregory category 2 impactions were more common in Class I malocclu-sion, a finding which was statistically significant (p<0.001). 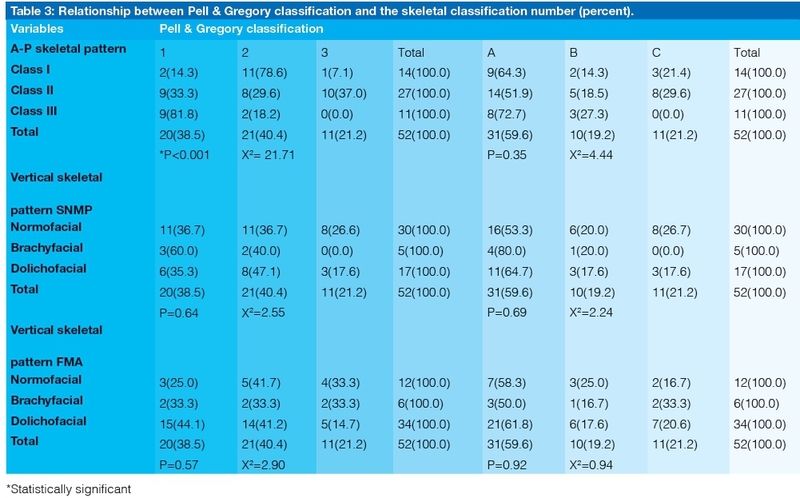 The other relationships between the categories of M3 impaction assessed by applying the Pell and Gregory classification and the Winters system are shown in Table 3. Analysis of the data found a relationship between Winter's classification and antero-posterior skeletal classification, but not with the vertical skeletal pattern. This implies that the antero-posterior length rather than the vertical height of the jaw plays a more significant role in M3 impaction - as previously reported. The Pell and Gregory classification also found a significant relationship bertween the antero-posterior skeletal pattern and the class 3 impaction in which the M3 is seated deepest in the mandibular ramus, a category seen almost exclusively in skeletal Class II. This is similar to the report by Sogra et al., who found a significant correlation between the Pell and Gregory classification of mandibular M3 impactions and the skeletal pattern.15 The results of the present study, however, differ from those of Sogra et al., in that while those authors reported a significant correlation between the Pell and Gregory 'ABC' sub-classification and the skeletal classification, our findings show a significant relation with the '123' sub-classification that is restricted mainly to Class II malocclusions. This may be attributed to the fact that skeletal Class II jaws have relatively smaller mandibles which are likely to have more severe space deficiencies than other skeletal jaw types, and hence more severe M3 impactions. In conclusion, M3 impaction has been shown to be prevalent among orthodontic patients in this locality. Although the prevalence of impaction is not significantly higher in any specific Class of malocclusion, more severe impactions were observed in Class II malocclusion subjects presenting in our clinic. The clinical importance of this is that comprehensive orthodontic treatment planning should prudently consider the management of the M3 especially in Class II cases associated with retrognathic mandibles.